* Newsflash! Red Hood is a pretty standard DCUC styled figure other than the addition of the cape. He's pretty well articulated and is definitely fun to play with. These feel quite durable and I've had no issues or concern with breakage problems. * While the body is rather simple with just a painted on outfit, the Red Hood helmet and cape combo does look really sharp. This looks so much like the outfit the Joker wore earlier in his career that I'm surprised Mattel hasn't reused the cape and dome yet to create a Red Hood version of the Joker. * To help him wage a war on crime the Red Hood comes with two pistols. I think these are simply recasts of the pistol that came with the Dark Knight Rises Gordon figure, but they work for the purposes of the figure here. * Again, I just love to draw attention to the Mike Thompson artwork on the back of the package. This is a wicked sweet rendition of the Red Hood's original, less well known outfit. The DC Signature Collection uses collector friendly packaging which means that it not only looks nice but that it can also be opened and sealed again without damage to the package. *Again, I just have to question why Mattel decided to go with this version of the character rather than the more common version of the character. It's just an odd decision, particularly when this line needed all the hits it could get. 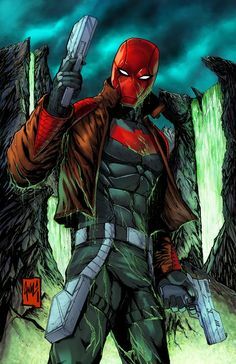 * Considering that the Red Hood uses two pistols and comes with two pistols, it would only make sense that he would come with two pistol grip hands, right? Wrong! While his left hand is a delightful pistol grip the right hand is a simple grip. That's a big miss. * Yikes! Those boots look pretty rough. They're simply painted on and the way they flare out right at the thigh swivel just does not look good at all. Plus, you can see the light gray plastic edges of the joints. This is another pretty big miss here. I'm a huge Jason Todd fan and I definitely like having such an obscure figure on my shelf. Still, this isn't the version of the Red Hood that anyone wanted. He's also not particularly well done. He's not atrocious but the weird boots and lack of a left handed pistol grip chip away at what seemed like an OK figure at best. At the end of the day, this guy simply squeaks by with an Eh and a 1/2 rating. Unless you're a huge Jason Todd fan, this guy can be skipped without any problem. I've only reviewed a few figures of Jason Todd as both the Red Hood and the Arkham Knight: From the video game Batman: Arkham Knight, I've reviewed both the Arkham Knight and Red Hood. In the New 52, there was also the infamous Red Hood gang, and I reviewed that version of the Red Hood from the Greg Capullo inspired DC Designer Series line. I've been tempted to get this figure. I loved Grant Morrison's Batman run and this version of Jason Todd is just crazy. I may need to price him out on eBay! He is really unique and definitely not a figure I imagine we'll ever see anyone else release. While I think making him was a very poor choice on Mattel's part so far as keeping Club Infinite Earths going goes, looking back I'm glad they released this oddball. I still hope we get a modern Jason Todd in the DC Comics Multiverse line, though. Happy Aliens Day! Better Late Than Never!